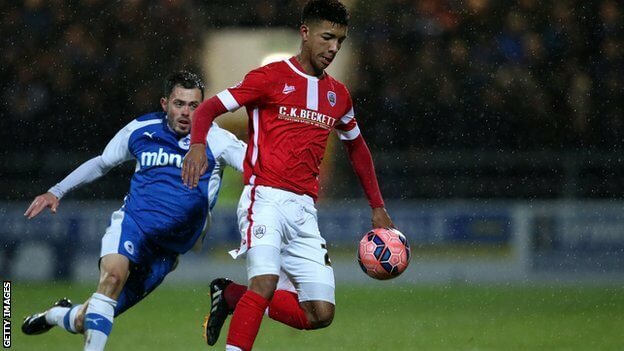 News in The Sun today that Newcastle are making a late move for 18 year-old defender Barnsley Mason Holgate, who Manchester United had hoped to sign this weekend. Manchester United had moved in for the Doncaster-born youngster and bid £1M for him, but Newcastle are said to now be in negotiations for the youngster with Barnsley. After Arsenal and Tottenham expressed an interest in him, Mason has been on trial at Manchester United this month, and it seems they have seen enough of him to want to sign him up. Swansea are also said to be interested in the player, but the news is that Newcastle have moved in quickly to try to tie up a deal for the very promising young right-back. Last season he made 22 appearances for Barnsley with one goal, after making his first team debut only in December of last year, playing the full ninety minutes of a 1–1 draw with Doncaster Rovers at Oakwell. His contact has one year left to run at Oakwell. Newcastle are pursuing a number of targets in the transfer market this summer, and they include signing up younger players like Mason, who will probably become part of Peter Beardsley’s Development squad. Newcastle may also decide to send him on loan to a Championship club, so that he gets the first-team playing time to help him develop as a footballer. Newcastle have signed up Dutch International midfielder Gini Wijnaldum for £14.5M, and expect to sign 20 year-old Anderlecht and Serbian International striker Aleksandar Mitrovic tomorrow for around £12.7M. Newcastle are also reported to be in negotiations for center-back Chancel Mbemba of Anderlecht, Monaco center-back Aymen Abdennour, and QPR striker Charlie Austin of QPR. He’d be bloody daft to come here with our record of destroying youngsters careers. As I’ve stated before you and your half wit side kick don’t read the blog you’re just here to troll. I said earlier what I did regarding the match whilst discussing football, search for it on google you may find it. Boring, bickery Sunday. We need some good news, fast. He is currently on trial with Man Utd who are on tour in the USA at the moment. Am I correct in thinking that Sacramento are not a top American club. The commentator called them a third tier club. They outplayed us in midfield for a lot of the game, if we can’t do better than that, then this season could be another struggle. Some one mentioned in a previous thread the Aarons has gammy legs, is there any basis for this comment. Ok he was injured for most of last season but that could happen to any player, doesn’t mean he is going to be crocked on a regular basis. When do the lads return fom the States ? Mitrovic has just landed at Newcastle Airport. @Essex: Also remember that he’s a young lad with a lot of pace and not enough muscle. Once you see some bulk in him, you’ll probably see his injuries decrease. It’s tricky to bring a young lad like that into a fully fledged regular. Villa have £32 million to use after selling Benteke to Manure, so are showing interest in Austin – he would be crazy to join them as after loosing Delph as well they are certainly a weakend relegation candidate team . What’s more their deal for new owners fell through as well. And Mrs. Austin certainly won’t want to live around Spagetti junction ! But QPR might hold out for silly money. People get selective memory with Tiote he has had a lot more shockers than good game for us ! Last season before he got injured he was shite that Burnley home game he was terrible , kept losing the ball and their midfield were just waltzing through him ! Think Liverpool might be upset if Benteke rolls up at Manure. No fella but he has just landed. I wonder if we have anyone at the airport re photos. Can’t say fella or I would. Anybody recognise the background ? If he is at airport I’d expect someon will have seen him and got a photo. Plenty of NUFC fans up there work and jetting in/out on holiday. Wheres Belgrade Geordie when you need him ? Trust me on this he definitely landed at Newcastle Airport about 20 mins ago. I don’t recognise that photo but if it’s a very recent one ie last 15 mins it’s Newcastle airport —-Definitely here now. Has he brought his mate, the CB? Bit of a misnomer that. who have we developed! Isnt Benteke the same kind of player as Carrol? I thought the bin dippers didnt want that kind of player lmao. Still think 5 seasons + is too long to wait for a decent CB being signed. At least it’s a better logo than ours! Hope he gets plenty of game time, he needs it IMO. I’d have kept him over Obertron and Goufran, not that that’s much of a endorsement. bambams u sure about that? Yeah. I always thought he had a bit more about him than his Bro. However, he seemed to slip into laziness last season, but then again he was not the only one. If he does well in Cardiff then he might be worth one more chance. To be fair, there is a difference between somebody claiming to be an ITK, and somebody who passes a bit of info on they happen to have found out. I am sure it happens to us all once in a while.